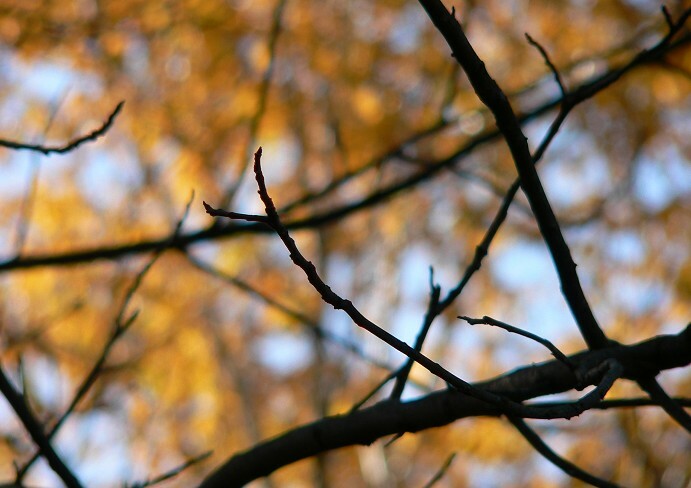 We’ve been having wonderful fall weather – bright blue skies, and the leaf colors still look beautiful. 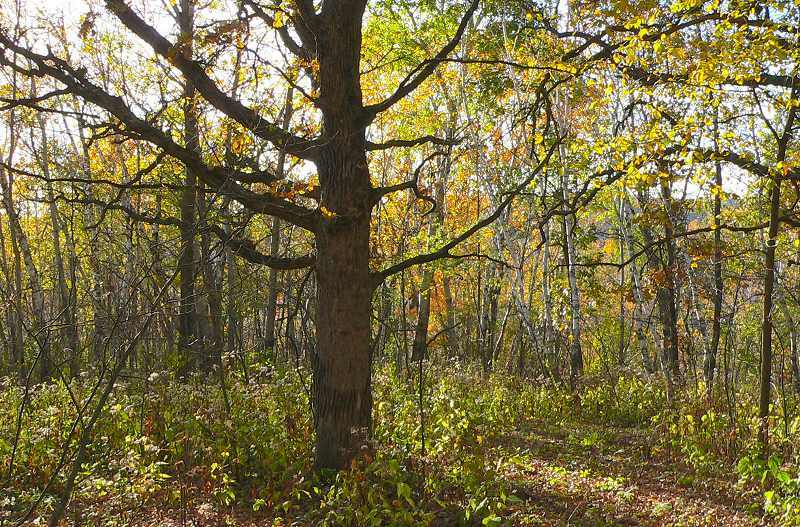 Our woods is dominated by oaks – Burr, Hill’s, Black, Red, and White Oaks. The colors of the oaks are darker and richer than maples, and the leaves seem to stay on the trees longer – they don’t blow away in early fall windstorms. 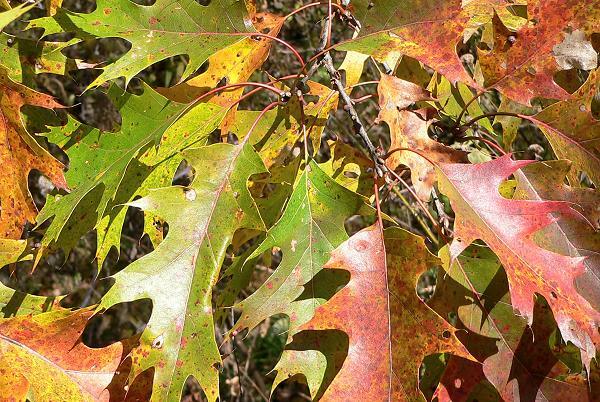 I think these are Red Oak leaves – I have trouble telling Red and Black Oaks apart unless I can see their acorns. The nicest time to look at leaves is in the early evening, when the sunlight is more golden, and the leaves really seem to glow with color. Here’s an old oak tree with the late afternoon sun coming through its leaves and the leaves of the trees around it. The prairie grasses look best in the evening, too. 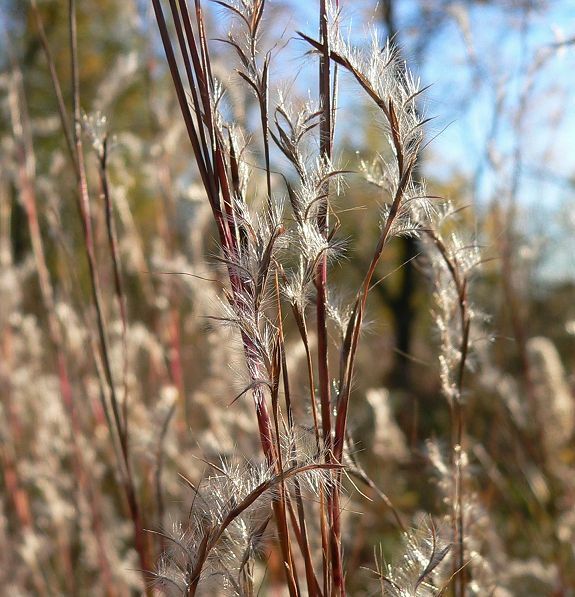 Here’s a clump of Little Bluestem with the sun behind it – it’s easy to see the fuzzy white hairs that surround the seeds. 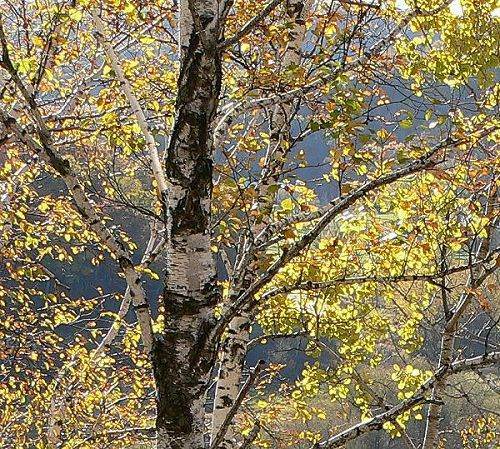 Even the birch trees look nice with the sun shining through their leaves. Birch and aspen are such weedy trees in prairies that I sometimes forget to appreciate how beautiful they look – especially in the fall. This is a Paper Birch on Sumac Point. The maples we have are all Red Maples. There’s a grove of Sugar Maples growing across the road from us on a north-facing hill, but I haven’t found any on our land. It could be because we don’t have many north-facing slopes. 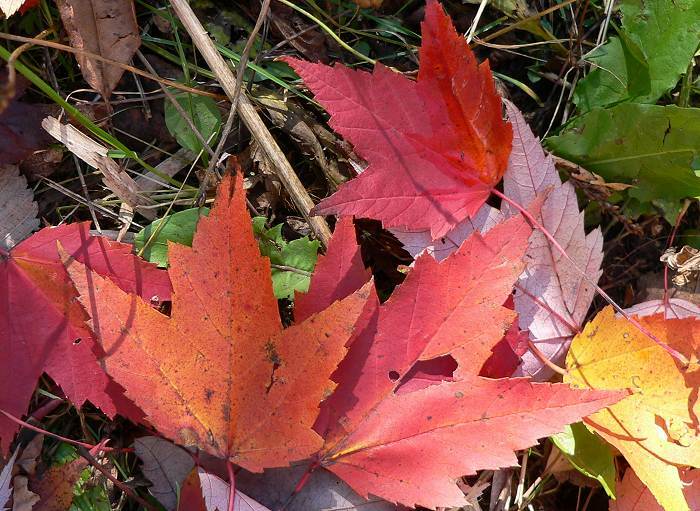 The Red Maple leaves don’t have the flame colors – the brilliant oranges – that the Sugar Maples do – they turn either yellow or a beautiful bright red. And the trees seem to grow by themselves in the woods, not in groups like Sugar Maples. The apple trees have mostly lost their leaves by now, but some of them are still hanging on to their apples. Our apple trees aren’t cultivated varieties, so there’s a huge variation in what they look like and how they taste. 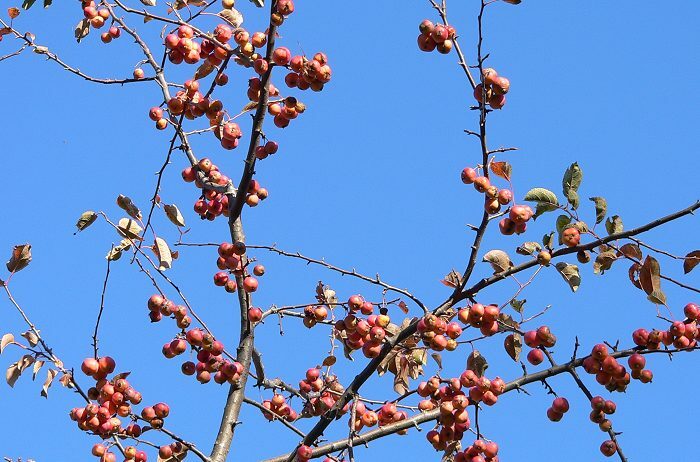 It’s fun to pick and taste an apple from every tree as we walk by – each one is different. This week I found one that had very small apples. They were about 1 ½ inches in diameter, and the branches were loaded with them. I tasted one, but they had been frozen so they didn’t taste very good. I hope the birds enjoy them. There are still quite a few migrating flocks of birds flying through. 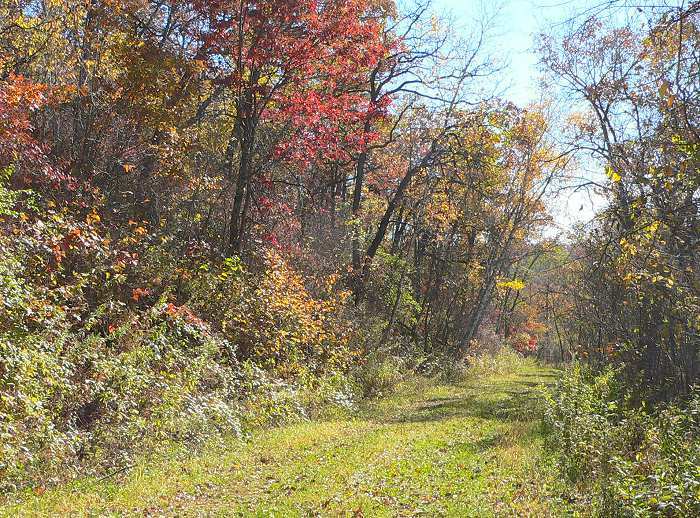 I came on one at the top of the path from Starflower Opening – it was mostly Robins, but I also saw 5 or 6 Northern Flickers, both Ruby-crowned and Golden-crowned Kinglets and some unidentifiable (for me) fall warblers. There are still bluebird flocks in the wetland and along the driveway. 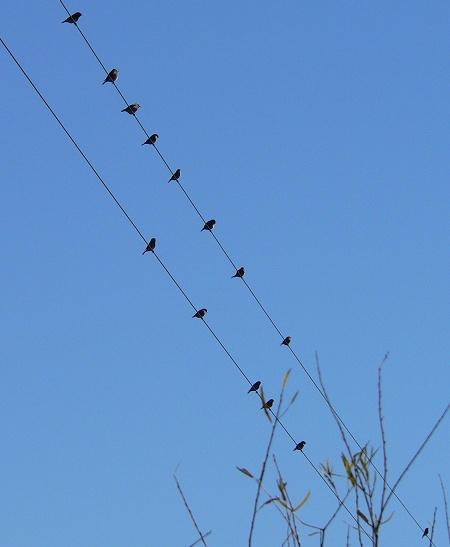 Here’s one flock of bluebirds that was sitting in a row on the power lines that run through the wetland. And here’s the farm road through our western valley with all its glorious fall colors.